Gina Rodriguez (Jane the Virgin TV series) plays a Mexican-American woman living in current-day Los Angeles whose innocence transforms into determined survival. After escaping an attack of bullets in a Tijuana nightclub, she's abducted by members of the Mexican drug cartel and forced to carry out their plans of drug trafficking and murder. The plentiful twists in this film force the unlikely female anti-hero to endure shoot-outs, an exploding car, being an informant for U.S. law enforcement, and competing in a Mexican beauty pageant (where the film gets its name). How can this woman maintain her allegiances to dangerous men and survive at the same time? 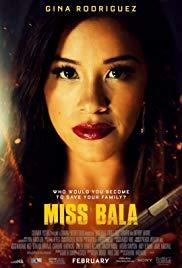 Although Miss Bala has some memorable and intense moments (and includes a cast of promising Latin and Mexican actors), it felt strangely timid or reticent. So the inferred violence and danger doesn't feel very believable or heavy. It was almost like the film was an educational template for young aspiring filmmakers to learn the basics of plot structure and storytelling. All the ingredients are there...except for inspiration. Miss Bala doesn't boil with ridiculousness or over-the-top action, but it isn't ice cold and devoid of human emotion either. It lands somewhere in a lukewarm place.